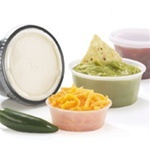 Make dipping convenient for your loyal food patrons by providing plastic translucent sauce cups for easy access dipping of sauces and condiments. As you can see below, we carry a wide assortment of clear souffle cups, translucent soufflé cups, and other plastic portion cups for your restaurant to serve mayo, mustard, ketchup, soy sauce, salsa, salad dressing and cheese dip in. With the provided selection of portion cups and souffle cups presented below, we're almost certain you'll be able to cater to your customer condiment needs at the dinner table. Liddles Portion Cup With Lid - 2 Oz. Liddles Portion Cup With Lid - 4 Oz. Solo Souffle Cups Translucent - 1 oz. Conex Complements Portion Containers Clear - 0.5 Oz. Plastic Souffle Cup Translucent - 3.25 Oz. Polystyrene Portion Cup Translucent - 3.25 Oz. Portion Cups and Sauce Cups are an essential need when opening up a bistro or large restaurant nowadays. Customers love sauces and they need the appropriate condiment cups to fit their needs. Why not cater to your loyal patrons? Find an array of condiment and sauce cups right here at Round Eye Supply's restaurant supply store. Rely on our restaurant supply store for quality and affordable restaurant and food service supplies that are eco-friendly.